Your activewear brand needs a little kick! 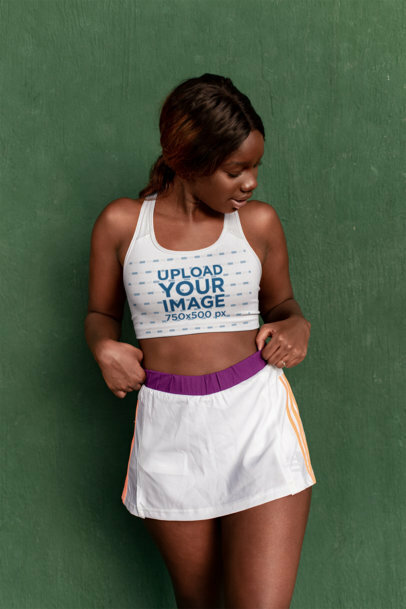 Create an eye-catching and amazing campaign for your sports bras with Placeit! Our mockups are super lively, sporty and fun. Captivate the strength of this MMA fighter wearing her Sports Bra. Your design will look amazing. Try it out, it's easy and fast. Launch your activewear collection in the most outstanding way! With Placeit's unique visuals, you can take your brand to a whole new level customizing professional-looking mockups. Are you ready to try them? Just choose your favorite ones, like this sports bra mockup of an MMA athlete rehydrating herself, and in a few minutes, you will have a whole set of visuals ready to display online! Promote your gym or activewear brand with a photorealistic mockup from Placeit, featuring an athletic woman wearing a sports bra while holding a weight bag at a studio. Put your logo or original apparel design on this mockup and transform it into a promotional image in no time, and without the need of any additional software! Show off your sporty t-shirts in the boldest way there is! With Placeit's photorealistic visuals, you can customize as many mockups as you want and display them all over your social media pages and POD websites in no time to boost your sales. Are you up for the challenge? 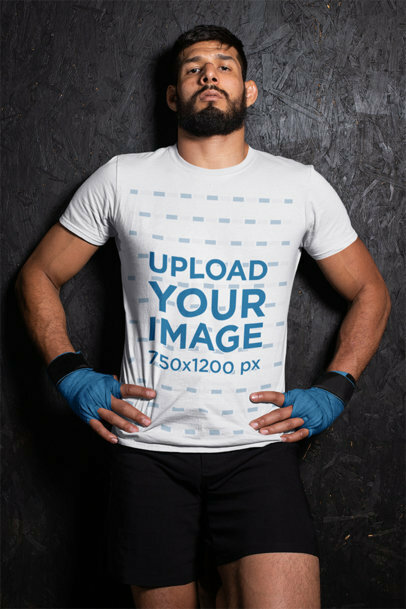 Start with this t-shirt mockup featuring an MMA wrestler at a boxing gym and improve your marketing strategy right away! Create a strong visual for your customers with Placeit's apparel mockups! Placeit has a whole collection of sports mockups that are great for anyone. 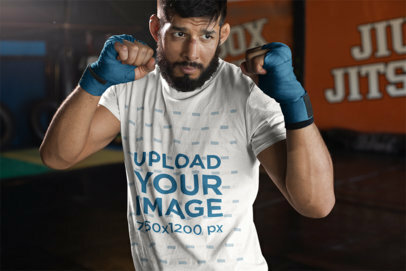 This mockup is perfect for MMA Fighters and athletes looking for the best apparel. Your store will get a ton of clicks, follows, and views. What are you waiting for? 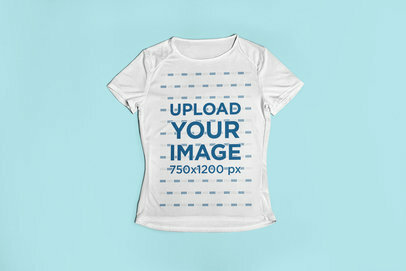 Edit your T-Shirt mockup now. Bring your competition to the ground with outstanding visuals! 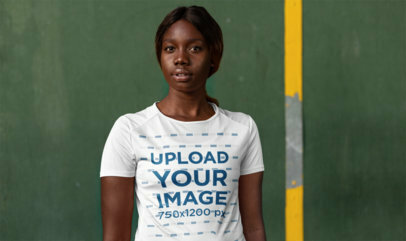 Start using Placeit's t-shirt mockups and promote your activewear in a unique way. Are you up for the challenge? Just choose as many mockups as you want and spread them all over your social media pages or POD websites, and amaze your customers! It's your turn, start using Place it now and improve your sales. 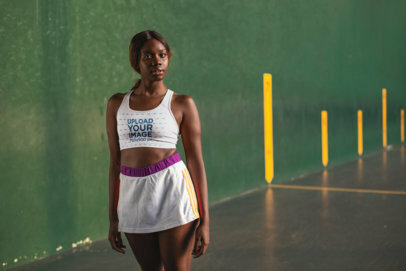 Show off your cool activewear design with an actual model. Placeit brings it all to you, just choose from any of our mockups, edit the settings, and you'll be ready in no time. This mockup is perfect for athleisure- wear, MMA sports or activewear. Cool, right? Try it out, it's easy and fast. 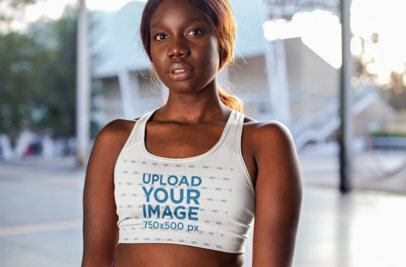 Create your Sports Bra mockup now. 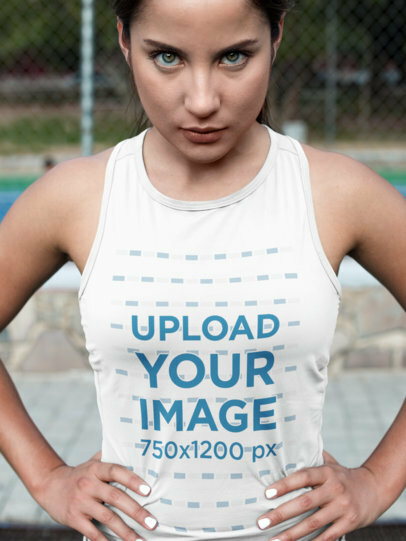 Promote your activewear designs and brand on an actual garment with Placeit! It's easy, just select from our awesome sports bra collection, choose your favorite and edit the settings to your style. You'll be ready in no time! This mockup represents a strong female MMA fighter training, it will be a powerful visual for your website or Instagram. Try it out, create your sports bra mockup now. 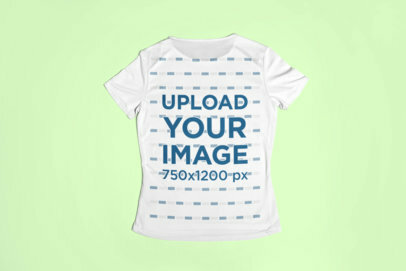 Create an awesome visual for your customers with Placeit's apparel mockups! This mockup is perfect for Sports Bras and sporty girls looking for the best apparel. Your store will get a ton of clicks, follows, and views. What are you waiting for? 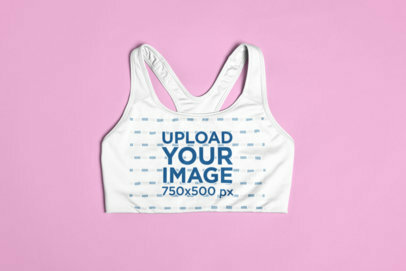 Edit your Sports Bra mockup now. 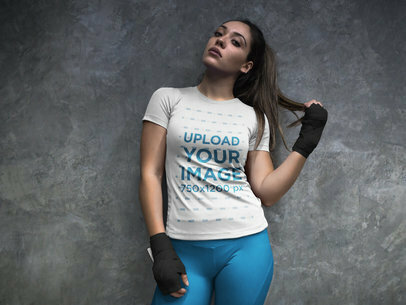 Showcase your activewear designs with amazing promotional pictures made with Placeit's apparel mockups. This photorealistic mockup features a badass fighter in a tank top, ready to hit a dummy in an octagon. What are you waiting for? Improve your digital contents in social media and boost your sales with Placeit's mockups today! 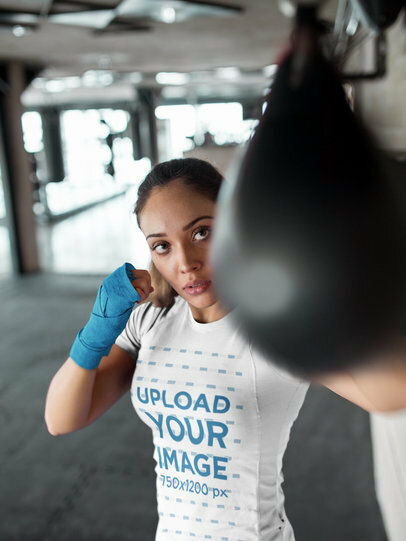 With Placeit, you can portray that tenacious personality of your brand with a bold picture featuring a badass female fighter preparing for a match. This sports bra mockup is perfect to promote an apparel brand or even a boxing gym, and the intensity of the picture portrays that fit personality. Try Placeit now! 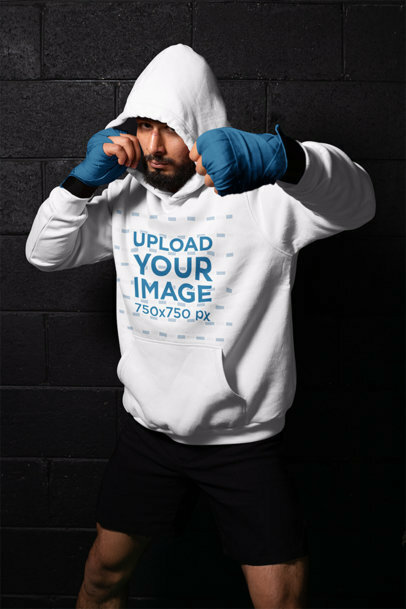 Knockout your customers with amazing visuals for your new activewear collection! With Placeit's smart and easy-to-use mockups you can customize as many images as you want and use it for your marketing material. Are you ready to try it? 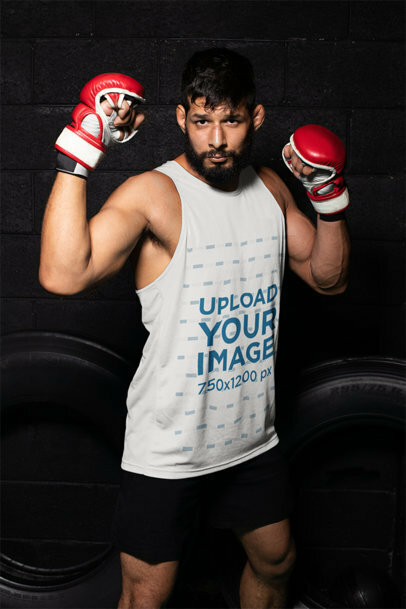 Start by putting your design into this tank top mockup of an MMA wrestler and a punching bag and boost your sales today! Knockout your competition inside and outside the octagon with badass visuals for your activewear collection! Placeit's tank top mockups will help you showcase your jersey designs online and boost your sales in no time. What are you waiting for? Start customizing as many mockups as you want and spread them on your social media and POD websites today! Knockout your competition with eye-catching visuals for your activewear collection! 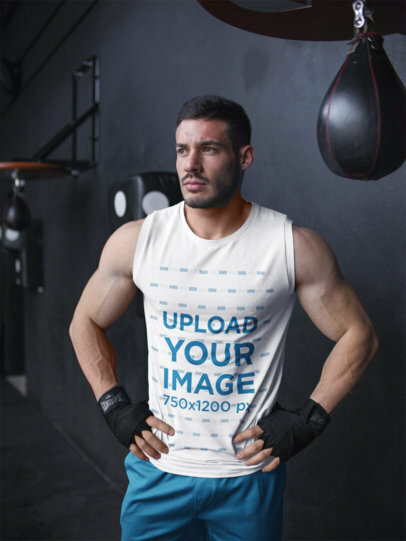 With Placeit's sport tank top mockups you can easily customize a whole set of attractive pictures to display all over your social media or websites. Are you ready to try it? Start by customizing this incredible tank top mockup of an MMA fighter kicking a punching bag and boost your sales today! Make your marketing jabs punch hard over your competition! Start customizing outstanding visuals by Placeit to showcase your activewear collection all over your social media pages or POD websites. Are you up for the challenge? Try this tank top mockup of an MMA wrestler standing by a punching bag and improve your sales today! Amaze your customers with new and bold visuals for your activewear collection! Start using Placeit's photorealistic mockups and in just a matter of minutes, you can customize a whole new set of attractive visuals for your social media pages or POD websites. Are you up for the challenge? 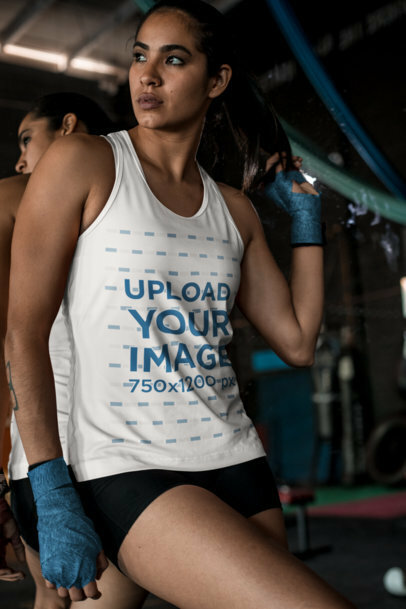 Try this tank top mockup featuring a female MME wrestler at a gym and improve your marketing strategy today. Takeover the sportswear world with dazzling visuals just like professionals brand do! With Placeit you can fully customize as many mockups as you want. 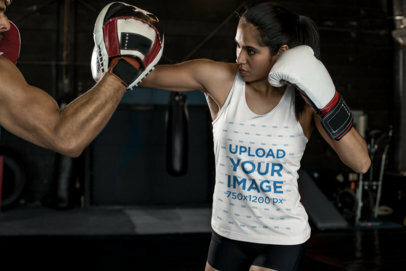 Start with this bold tank top mockup featuring a female MMA fighter punching a training pad, or check out any other of Placeit's wide collection. What are you waiting for? Improve your marketing strategy with Placeit today. 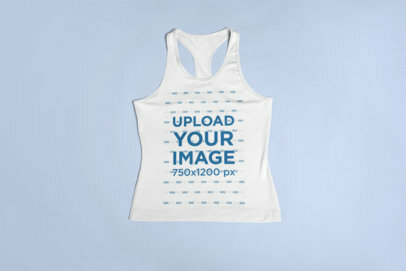 Check out this amazing fitness tank top mockup that will be perfect for promoting your design. Placeit creates a mockup that anyone can use and they don't require any additional software whatsoever. Cool, right? You can even change the background and tank top color. Try it out, it's easy. 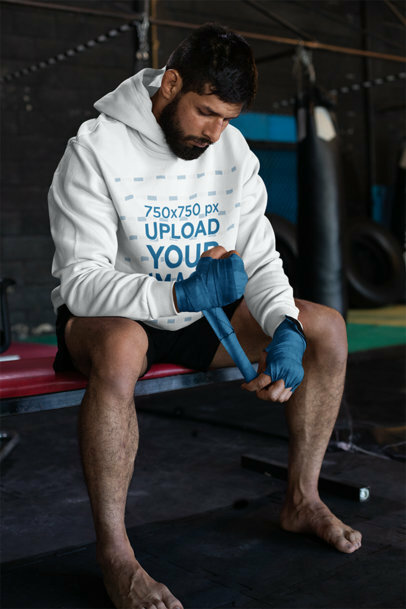 Promote your gym or fitness apparel brand with this amazing mockup of a strong athlete wearing a singlet and lifting dumbells at the gym, next to a boxing bag. This video mockup from Placeit features a cool parallax effect that gives it a totally dope look. Place your logo in this mockup and boost your business with Placeit! How cool would it be to showcase your newest fitness jersey designs in a professional and relatable way to your potential clients? Well, with Placeit's original mockups this is easier than ever. We know you'll use our mockups in your visual marketing campaign. 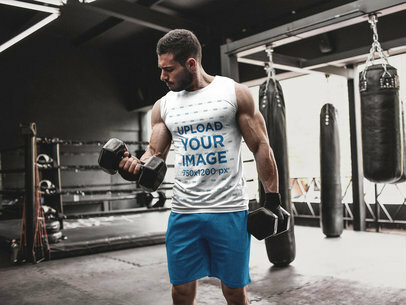 Use this gorgeous sports mockup featuring a man lifting weights while wearing custom athletic singlet apparel, you will be able to promote your latest designs for custom workout shirts in a really easy and photorealistic way! Use the menu on the right side of the page to choose his clothes' colors, then drag-and-drop your jpeg or png image file over the upload button on the left. Easy, right? Have a look at this gorgeous visual asset featuring a Hispanic woman hitting the pear bag while at the gym, she's wearing custom athletic apparel. Promote your latest fitness design for a sports tshirt now! The menu on the right side of the page will let you choose her custom athletic wear colors, then drag-and-drop your image file over the upload button on the left. Easy, right? Try your design on another Custom Workout Clothes! Use this awesome mockup featuring a super muscular man standing in the dark while wearing custom fitness singlet apparel to promote your latest design for custom athletic apparel in a really simple way. This mockup is perfect for sports brands. Start now! It's easy to use and doesn't require any additional software. Cool, right? 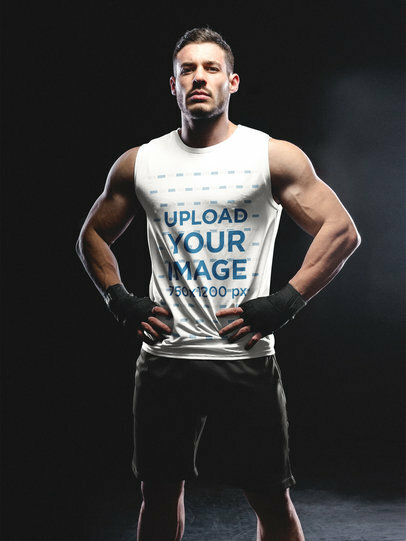 Use Placeit's fitness mockups to promote your latest design for custom sportswear in a beautiful and photorealistic way! 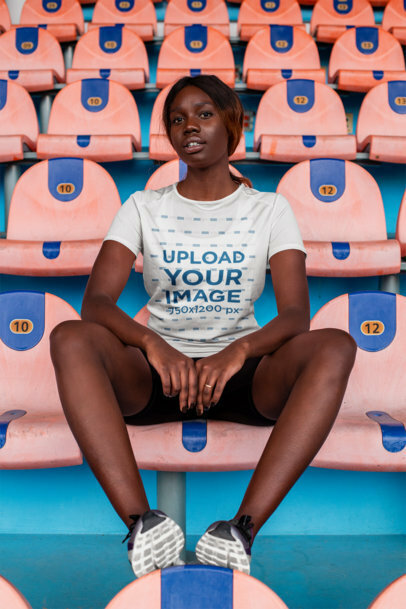 This one features a girl lying against a concrete wall while wearing custom athletic apparel, you can edit her custom workout shirts color with the HEX tool on the right. Then upload your design with the upload button to the left. Wasn't that easy? Try your design over another girl with Custom Athletic Wear! Use this gorgeous mockup featuring a muscular man wearing a piece of custom sports singlet apparel while standing inside the gym, he's near the speed bag. You can promote your latest design for custom athletic apparel in a beautiful and photorealistic way. Awesome, right? Start using Placeit now and make your revenue grow! Create a cool visual featuring a fitness woman wearing an athletic bra with Placeit's mockups and show your customers a more realistic version of your awesome sports bra design! Being able to see a more realistic version of an apparel design is a great way for your customers to know how the product will look like when they buy it. 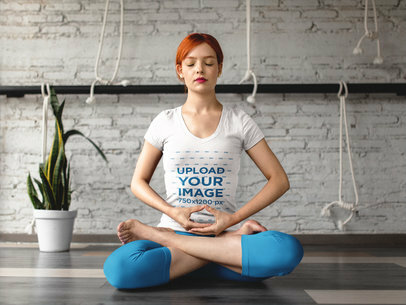 Have a look at this awesome mockup featuring a girl in a yoga lotus pose, she's meditating while wearing custom fitness apparel, you can edit this image to promote your latest sports design for custom workout shirts in a really easy way! Edit this girl's custom athletic apparel clothes with the menu on the right, then upload your design using the upload button on the left. Try another image featuring Custom Athletic Wear! 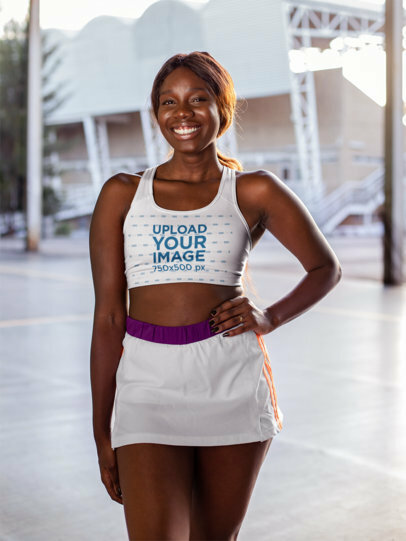 Create a gorgeous visual with Placeit and promote your fitness designs for a sports bra using a visually enticing image that your audience will most definitely love. Start now and put your sports bra design on a clean visual that will put your sports bra design in the spotlight, your customers will get caught by your product and not by the environment! Get ready to increase your fitness clothing sales when you start promoting your amazing sports jerseys with Placeit. We create easy to use apparel mockups that anyone can use. Like this one featuring a sporty woman in a stadium, your design will be the first thing people see. Cool, right? Edit your sports jersey mockup now. Get ready to start promoting your sports jersey design in a super eye-catching way. We create fitness apparel mockups that anyone can use with no complicated software. This mockup displays your design front and center, and you can even change the jersey's color. Cool, right? Try it out! Want to see your sports bra designs portrayed in an amazing and photorealistic manner that will entice your audience to gather up potential customers? Look no further, Placeit is just the place for you. This simple and beautiful mockup of a gorgeous black model looking down in front of a green wall is just what you need to promote your fitness designs. Ready to get your activewear designs out for the world to see? Start promoting your sports bra designs with Placeit! We create functional, trendy, and easy to use mockups that are perfect for anyone. 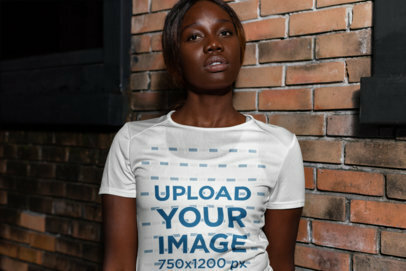 Like this mockup featuring a fit woman, your design will be the first thing people see and you can even change the color! Cool, right? Try it out now. Create a gorgeous visual to promote your fitness designs for a sports bra with Placeit's mockups! This amazing visual is a perfect choice that you should use to showcase your sports bra design using a photorealistic image that your customers will love. Using a visual like this is great because your customers will see a real-life version of your apparel product being used in a real-life situation! Check out this cool fitness jersey mockup! The newest addition to your marketing campaign. Your newest designs will look so awesome in this rad new mockup. It's super easy to use and you'll be enticing your customers in no time with it. How rad would it be to see your newest designs in a cool sports bra modeled by a professional model and shot by a pro photographer? Now it's easier than ever with Placeit's fitness mockups. Now it's up to you to simply enjoy the professional look your designs will have and to showcase them to your customers. 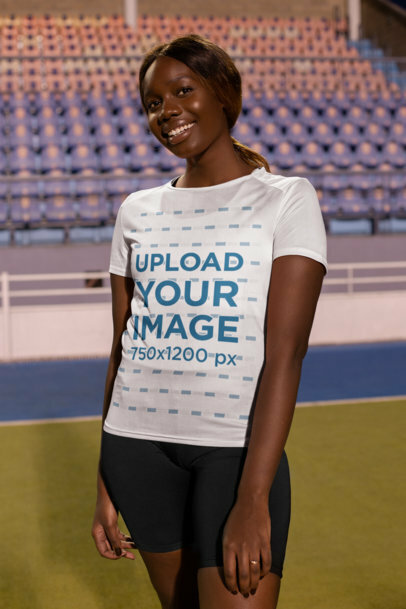 This portrait of a sports girl wearing custom workout clothes is an excellent choice if you were looking for an image to showcase your design for fitness sportswear. Start now! The menu on the right side of the page will let you choose this woman's tank top, then drag-and-drop your jpeg or png image file over the upload button on the left. Easy, right? Try another Custom Athletic Wear! Use this gorgeous visual featuring a beautiful girl wearing custom sportswear and boxfit hand gloves while against a concrete wall inside the locker room and amaze your audience with a stunning visual! Use the menu on the right side of the page, then upload your fitness design with the upload button on the left. Easy, isn't it? Start using Placeit now and make your revenue grow! 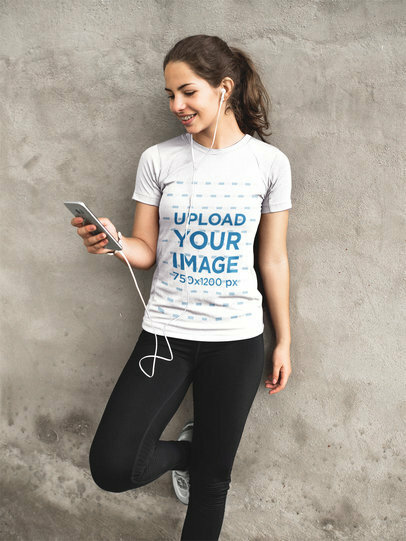 Promote your design for Custom Workout Clothes with a different image! Use this awesome mockup featuring a woman at the gym wearing hand wraps and custom sportswear to promote your latest sports design for custom athletic apparel! Choose this girl's custom fitness apparel colors with the HEX tools on the right, and upload your design with the upload button on the left. Wasn't that easy? Start using Placeit now and amaze your audience! Try promoting another design for Custom Athletic Wear! 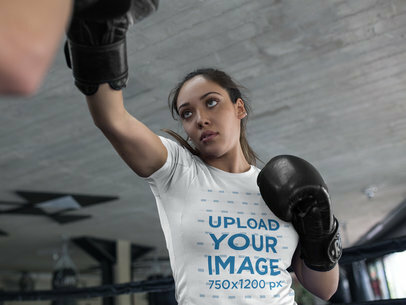 Use this beautiful visual featuring a muscular woman sparring at the gym while wearing custom sportswear for boxing and promote your sports designs for custom athletic wear. Use the menu on the right side of the page to choose her custom workout clothes colors, then drag-and-drop your jpeg or png image file over the upload button on the left. Easy, right? Promote other design for Custom Fitness Apparel! What better way for you to display your brand new sports designs within the context than with the help of clothing mockups from Placeit? 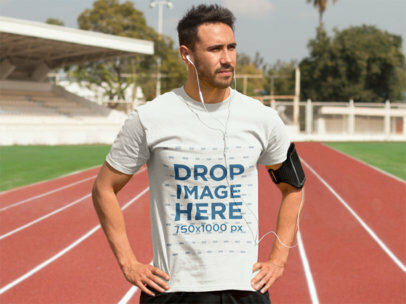 Use this t-shirt mockup featuring an athletic, muscular young man exercising on a track field to boost your visual marketing campaign and catch your potential clients' attention in no time. 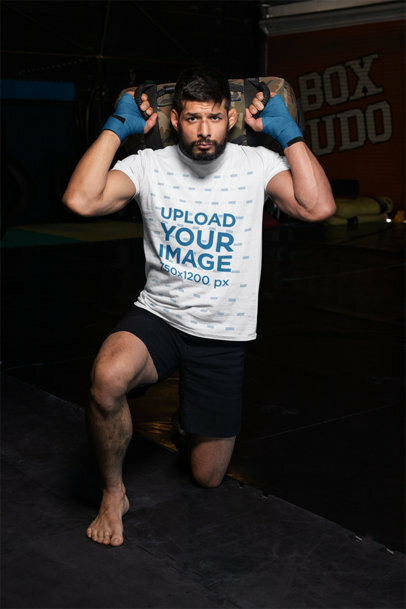 To use this fitness t-shirt mockup all you need to do is drag and drop an image of one of your designs onto the template and let Placeit handle the rest of the work for you. 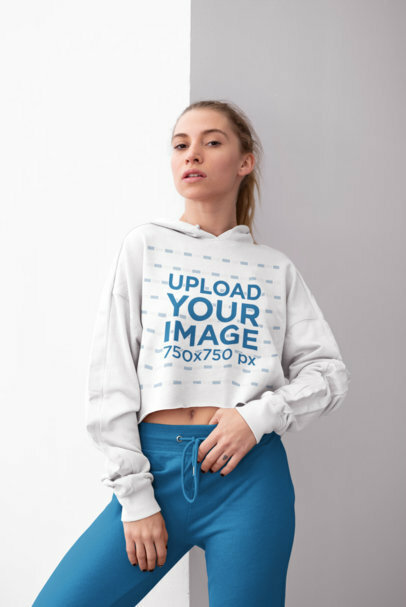 It's time for you to say goodbye to your outdated visual marketing campaign and start using clothing mockups from Placeit!